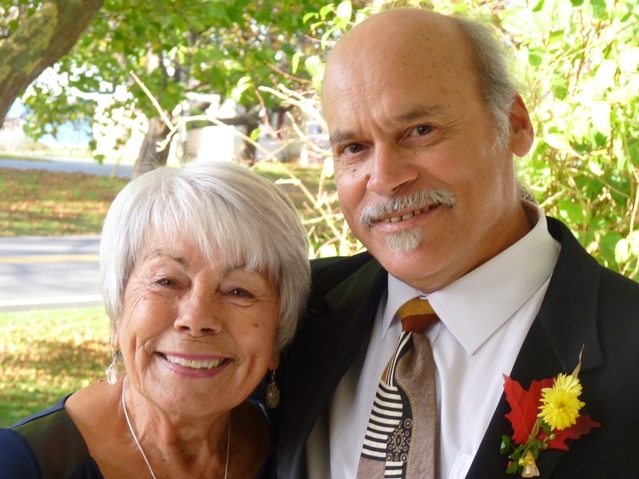 After the successful launch of the 1st book of my trilogy (please visit my website www.mrgaudet.com for much more on this) I am now working hard to publish the 2nd book...called "A Work in Progress: The Life my Brother Saved". My goal with this is to sell 100 copies in advance, to establish a built-in fan base when it comes out in the spring of 2017. Just to let you know, the book is completely finished and now, I am going through the manuscript with a fine tooth comb to weed out any small typos and to polish it up for its imminent publication. My appeal to you is to visit my Kickstarter Campaign ( Here is the link to the Campaign) that I have created to usher in the launch. At this moment, I have reached 63% of my target goal of $5000.00, with 11 days to go! This video (above) is short and sweet...less than three and a half minutes. Now, there are a few details of the Campaign that I would like to share, though when you visit you will see much more. Every Canadian contributor of CA$50.00 or more will receive not only a hand-signed copy of the book in the mail, but also YOUR NAME will be printed with GRATITUDE under the "ACKNOWLEDGEMENTS" section in the front of the book. You will see your NAME in PRINT when you receive your copy! 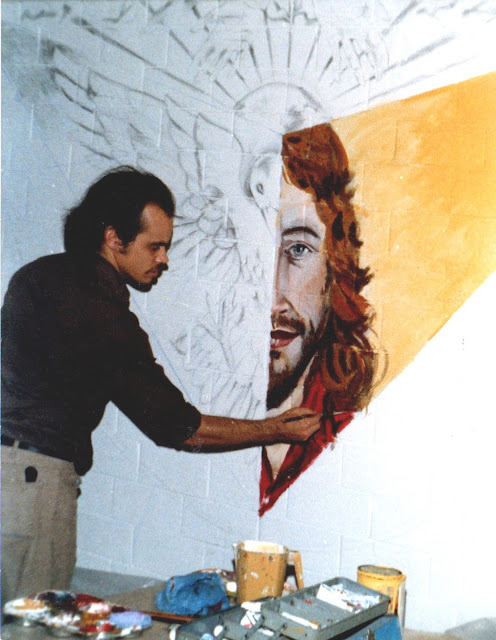 Spoiler Alert: I have opted to use a very powerful photo of this artist at the height of his career, working on the finishing touches of the truly monumental mural that this bog is dedicated to: The March of Trinity at Sacred Heart Chaldean Catholic Church in Saskatoon, Saskatchewan. 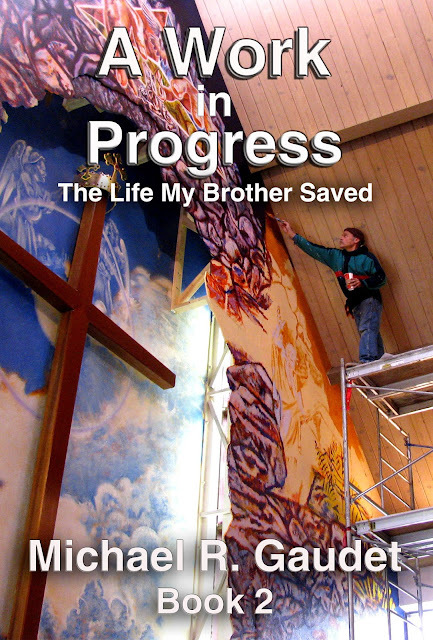 Cover Art for Book 2 of the trilogy, "A Work in Progress: The Life my Brother Saved". In case you have not the 1st book of the trilogy called "Dancing with Rejection: A Beginner's Guide to Immortality", I would like to offer you a FREE SAMPLE of the 1st 90 pages! Click on this link...it will whisk you away to the free sample of the 1st 90 pages...that will take you right into the thick of the story. Working on the early phases of "Trinity 1981" at age 23. 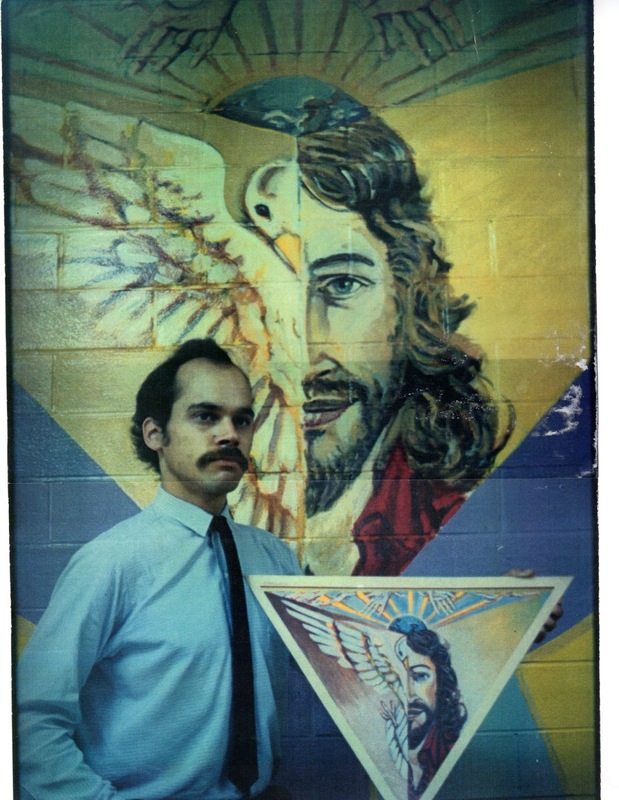 I was truly blessed at the age of 23 to be the recipient of a "vision" that resulted in the commission to design and paint the mural :"Trinity 1981". I go into lucid detail in Book 1 of the trilogy...the thought process and all of the machinations behind this pivotal work of art. This commission launched my career as a painter of monumental murals, and 30 years later, was pivotal in my bid to paint the most monumental mural of all: The March of Trinity. 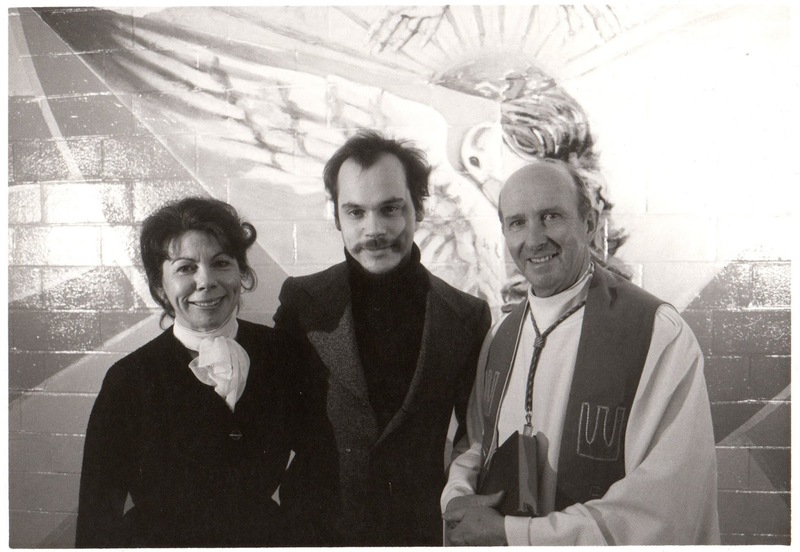 My beautiful mother Shirley Gaudet stood with the late Archbishop James Hayes and I after the official unveiling of "Trinity 1981" at St. Mary's Basilica. After the completion of "Trinity 1981", there was an official unveiling attended by not only the late Archbishop James Hayes, but also many family and friends, including my beautiful, loving mother, Shirley Gaudet. 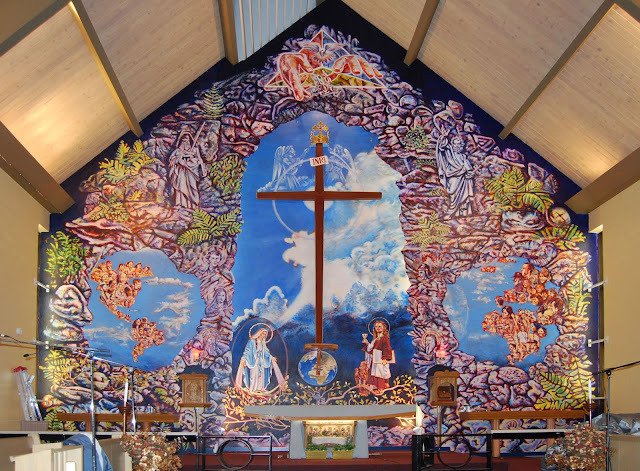 The finished mural "Trinity 1981". Readers of "Dancing with Rejection: A Beginner's Guide to Immortality" will understand the significance of the timing and importance of this mural in forging ahead with my career as a painter of monumental murals. Also, they will appreciate the artistic reasoning that fueled the project. 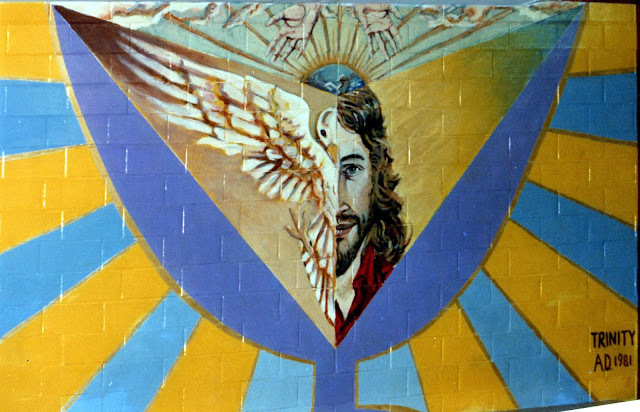 I created a triangular version of the "Trinity" mural that was widely circulated. I sent a copy to the Vatican that, incredibly for a young artist, elicited an official response on the Vatican stationary. Now, in that "twist of fate" that I referred to earlier, I would like to show you the mural that I was commissioned to paint 30 years later. It is the "March of Trinity" at Sacred Heart Chaldean Catholic Church. The reason I take such pains to point this is out is because...in a similar fashion that "Trinity 1981" was described in Book 1 of the trilogy, "March of Trinity"...which is on a much more monumental scale but was in fact preceded conceptually by the mural at St. Mary's Basilica... a deeper and more informed description in a literary setting unfolds in Book 2. The finished "March of Trinity" mural at Sacred Heart Chaldean Catholic Church in Saskatoon. Please take a minute now to visit the Kickstarter Campaign that I described earlier. The widget below will take you directly to the Campaign. I will reward you with my deepest gratitude and as described at the top of this post, your NAME will APPEAR in PRINT as a sign of my gratitude along with, of course, a signed copy of Book 2 delivered to your mailbox in the spring of 2017, about 6 months from now. Finally, it would mean the world to me if you would deign to SHARE this with your friends and colleagues. THANKING you in advance, TOGETHER WE CAN DO THIS. Well, I am seriously delighted to say...at over 50% home-free with the Kickstarter Campaign that I created to usher in Book 2 of the trilogy, I believe that I will succeed with raising my target goal! Cover Art of Book 2 of the trilogy. As you can see by the widget above, I have reached 31% of my funding goal within about the 1st week since launching the campaign. Thank so much to all of the early contributors. My expectation, with the widget, is that it will inform you, in real time, of the advance of the campaign. How cool is that? Hello friends and allies...I am excited to announce the creation of the Kickstarter Campaign to usher in the imminent arrival of Book 2 of the trilogy...called "A Work in Progress: The Life my Brother saved". Cover Art for Book 2 of the trilogy! Please click through to this link to visit the Kickstarter Campaign. And also, if the spirit moves you...please SHARE the link with your friends. Writing is my PASSION PROJECT...please help support this with your contribution. Thank You! Holding "Dancing with Rejection" in front of the official banner. Please visit www.mrgaudet.com , where you will find all 3 formats (Hard-cover, Paper-back and EBook) available. "The Art of Michael R. Gaudet has generated 54.882 views to date..."
So, I must console myself that "Dancing with Rejection: A Beginner's Guide to Immortality" relies on the fact that it is enjoying grassroots support and success with hundreds and hundreds of copies being purchased and read by you. On that note, THANK YOU for all of your continued support. It is EXTREMELY gratifying that you appreciate all of the energy, passion and love that I have poured into this writing project. 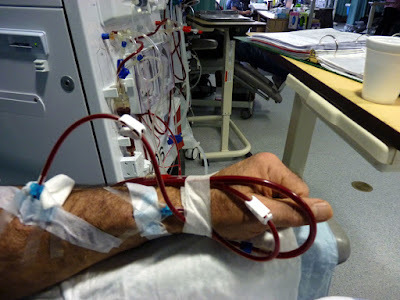 As a Dialysis Warrior...it's going on 32 months with absolutely no end in sight!...it is vitally important to me that I MUST carry on with my writing. God only knows if I will survive long enough to publish book 2 and book 3 of the trilogy. There are NO guarantees whatsoever that I will ever be the recipient of a 2nd "Gift of Life", as you know very well. This is my appeal to go over the heads of the Saskatchewan Book Awards, who in their wisdom have disqualified "Dancing with Rejection" from an award. Please help prove them wrong with your continued support. This is a rallying call for all of my friends and supporters to rise above this temporary setback...please visit www.mrgaudet.com where you will find all 3 formats of "Dancing..." available, including of course the EBook version. I would certainly appreciate if you SHARE this with your friends...together we can continue with the groundswell of good will and support for my Passion Project. When you visit my website, you will see some very high power endorsements from several amazing supporters. ((Mind Blown!!)) Can you help out...you will NOT be disappointed. This book is like a "life support system" for me, and my most valiant and authentic effort to earn my "mark" on the world while I still have the energy...albeit flagging as dialysis drags interminably on and on...to carry on. Please stay tuned in the coming days for the skinny on an "All-Inclusive Spa/13-Step to a Finished Painting Retreat Weekend". In this day and age of rushing from one activity to the next, it might be very refreshing to set aside an entire weekend to pamper yourself at the world-famous "Manitou Springs Mineral Spa". I checked in with the manager of the Spa and she very graciously sat with me to create a price list for both single and double occupancy, that includes meals and soaks (in the zero-gravity mineral waters that attract hundreds of thousands of people every year!) 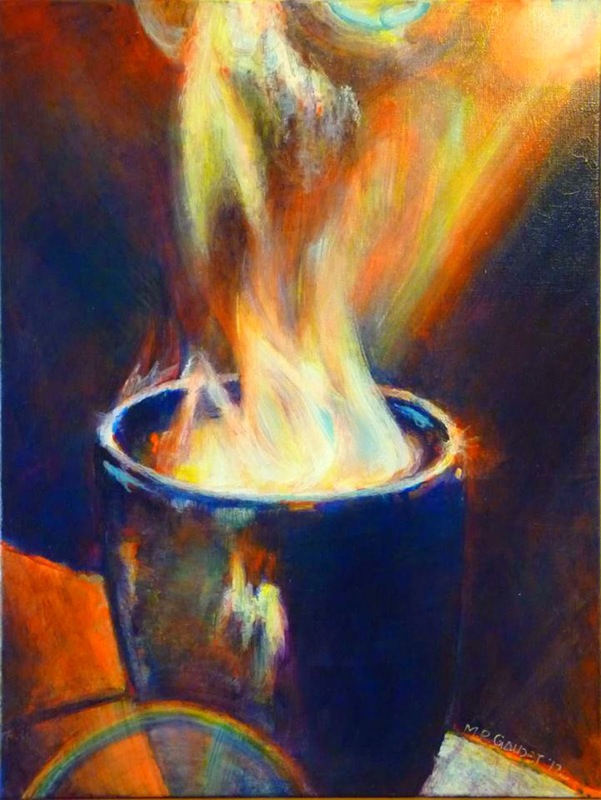 that will beautifully compliment my offering of the "13 Steps to a Finished Painting" Workshop. After 3 very successful workshops this summer and fall, I felt it was time to up the ante with an all-inclusive weekend. I really believe that the combination of benefits with the super-relaxing soak/float along with nice meals and the workshop will make for excellent results ( re: the painting) and the participants will be thrilled with the finished piece that they may subsequently hang in their homes with pride and self-satisfaction. 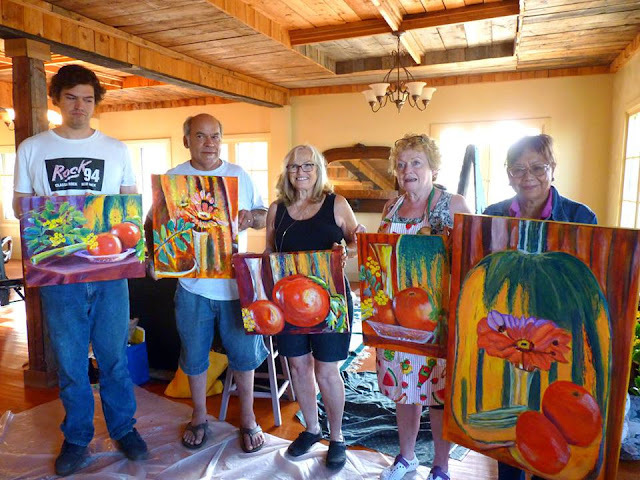 Participants in a recent "13 Steps to a Finished Painting" Workshop with their completed paintings. It gives me a lot of satisfaction and pleasure to witness the delight of the participants when they see how rewarding the 13-steps technique really is! I have heard time and time again from my "peeps" how delighted and surprised even, they are when they complete a vivid, gorgeous painting in the allotted time. I carefully guide them through all the technical steps...nothing flim-flammy in my process! Actually, I create an atmosphere of total trust. With hands-on step-by-step demonstrations, I thoughtfully carry the group through all of the specific 13 steps so that each and every one of you comes out the other end of the (total of) 8 hours over two days. All that I ask is that everyone follow along with every step, so that you are guaranteed to arrive at a strikingly beautiful, original work of art! 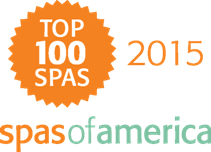 Lest you need a bit more convincing, Manitou Springs Mineral Spa has been the recipient of multiple awards over the past few years. This workshop will be a REALLY good time! Now, before I sign off, go ahead and check my website to get a feel for my qualifications as one of Canada's leading "painter of monumental murals". 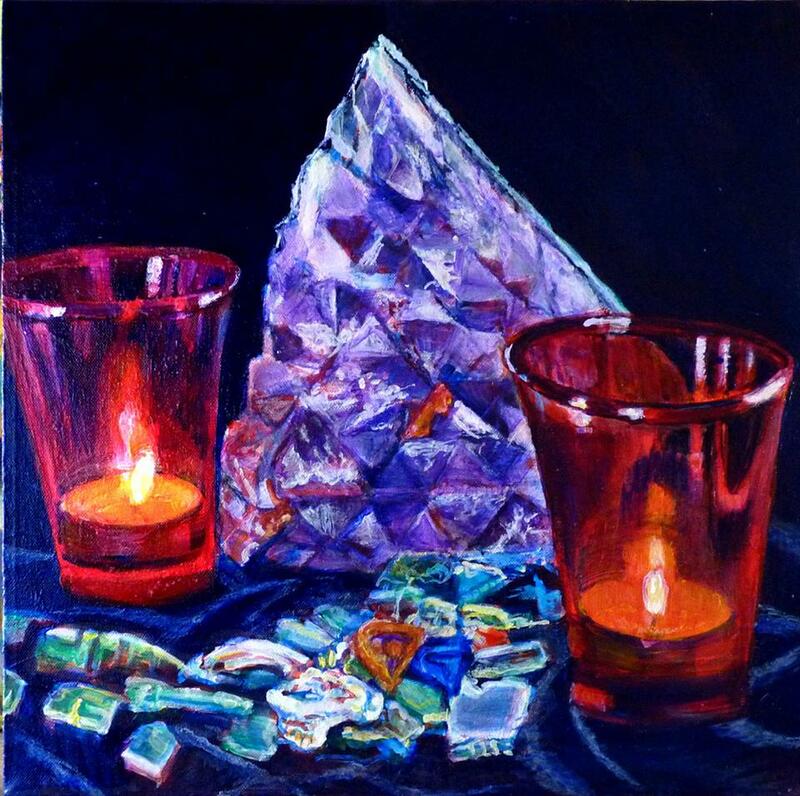 Over the years, I have perfected and streamlined my painting technique...thus I can offer this expedited, accelerated "13-Step" workshop with 100% confidence. As stated earlier, I will follow this post up with a "W-5" (Who, What, Where, Why, When) poster. Spoiler Alert: The workshop will take place on the weekend of November 12-13, 2016. Stay tuned...over and out for now. 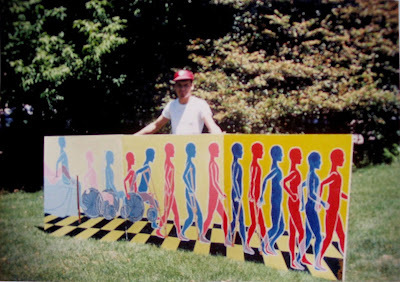 Even as a painter (of some repute in Canada) of monumental murals... the writing and publication of my first book was a daunting task...perhaps the most challenging project ever! 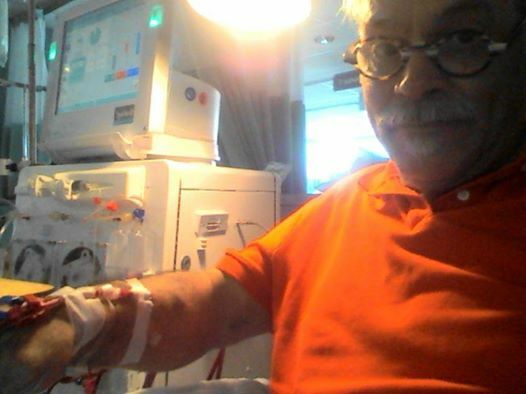 After a (wildly successful) kidney transplant that sustained me for over 34 years, I arrived full-circle back on dialysis in mid-May of 2014. One of the 1st things I did after returning to dialysis was to purchase a laptop. I wanted to put my time to good use and this is what I have done. After a long simmering process of writing and thinking, I decided that there was much more urgency to finish and publish my book. After all, if I didn't do it, it would NEVER get done and that was simply not an option! Within about one year my ambition was honored by the universe and I was treated to the thrill of holding the first "copy proofs" of (what we'll call) Book 1 in my hands. 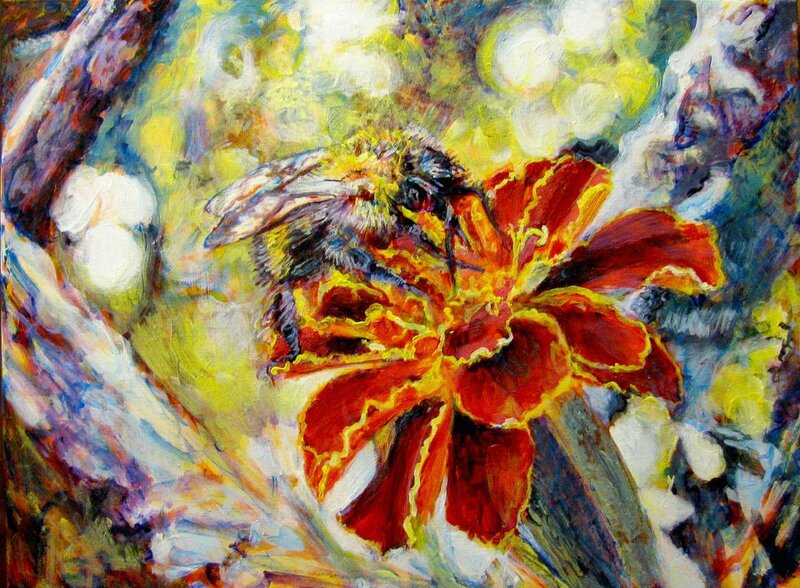 There are a lot of moving parts to a project of this magnitude so I am sure you can imagine what a huge rush it was to finally materialize such an ethereal pursuit! 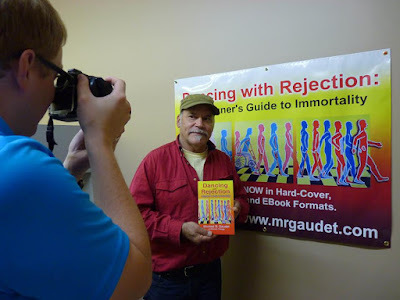 "Dancing with Rejection: A Beginner's Guide to Immortality" was squeezed out of the ether and into the material world. Now, the 1st book of the trilogy is out and receiving VERY positive reviews from some highly respected sources. Check my website to see for yourself. Point your search engine here for that. I wish I had boundless energy to convince you to pick up my book...to join the hundreds of readers who are part and parcel of a growing, vibrant world-wide community. 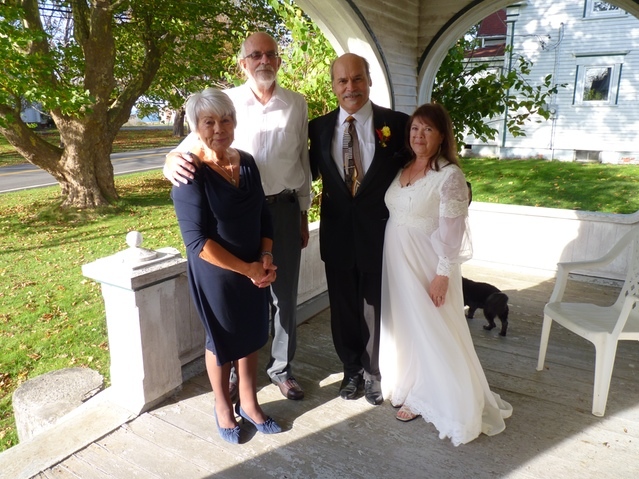 Last week, for instance, readers from California, England, Nova Scotia, Ohio and Ottawa acquired a copy! Daniel Bushman of the Watrous Manitou Newspaper photographs the artist, standing with the official banner trumpeting www.mrgaudet.com. Not to put too fine a point on it...however it must be said that certain acts of creativity can be achieved through the "art of writing" that are pretty impossible in any other medium. Even as an accomplished visual artist (of some repute) I can say with all honesty that the nuances, color, contrast and vividness of "magical realism" in writing has the power to evoke subtle changes in the emotional make-up of the reader. I'd even go so far as to suggest, when done extremely well, the impact can be PROFOUND! 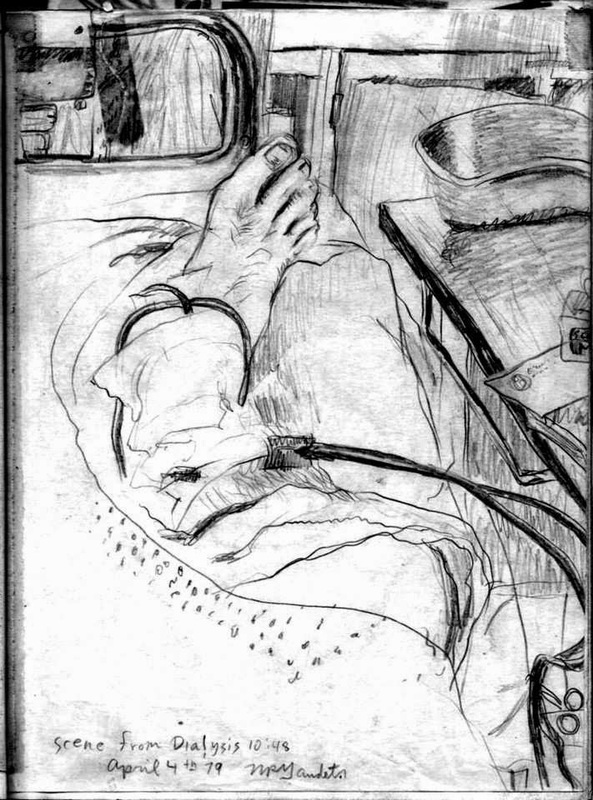 Here, I am going to share a link with you...the 1st 90 pages of "Dancing..." This will carry you right into the thick of the story, so hang on for the ride!